Note to readers/followers: My harshest critic, who shall remain unnamed, has said it’s confusing how these posts appear, esp. on Facebook where I’m sharing these essays from my blog. She says (oops did I reveal her?) that it’s difficult to tell when the stories on the blog actually happened. Well, OK, they’re time delayed about a week. It takes time to write, esp. on an I-phone screen, and I don’t always have that time. When I simply post photos on the Facebook site, those are in real time. She’s right, that can become confusing. But please – including my lovely critic-in-chief – bear with me as I try my best. 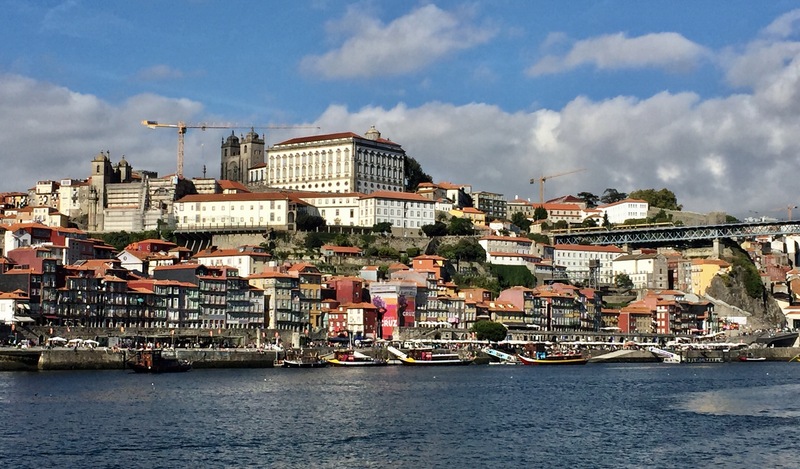 So now… to Porto where I arrived late on Sep. 11th and spent two full rest days as a tourist. 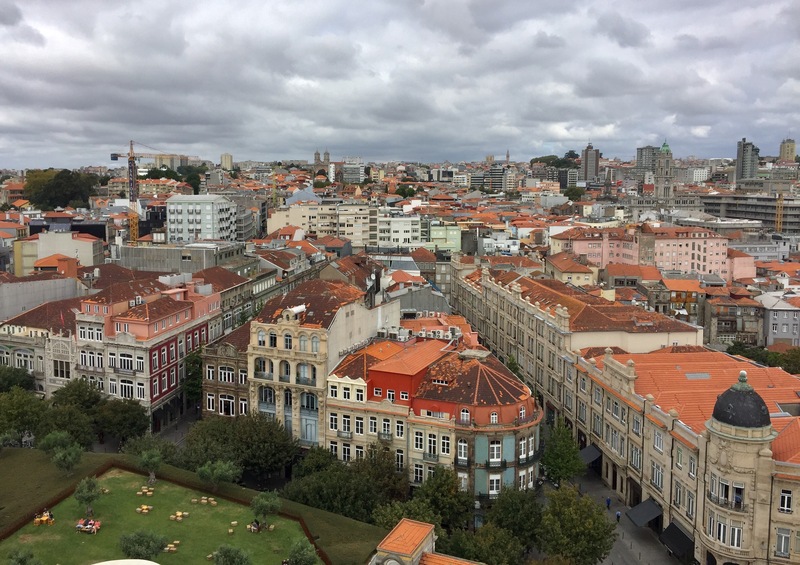 I couldn’t remember exactly what sort of room I had booked for myself in Porto, and as I approached the strange little hotel in the Praca Guilherme Fernandes Gomes, next to a tattoo shop, I started getting anxious, aggravated by my exhaustion from an extremely long walk (24+ miles, all-in, not counting a five-stop Metro ride). The young desk clerk took forever to get me signed in and explain things to me. She couldn’t read my body language which was screaming “my room please, now!” Finally she took me there, but we walked outside and I thought, “WHAT? ?” ( that’s the clean version). We went a few doors down and entered what was a small office building, an Advogado (lawyer’s) office. But there, across a narrow hallway from that good counselor’s office was a modern, clean and very spacious apartment… and it was all mine. Whatever I was thinking when I booked this a month or so ago, Thank God I was thinking right! I’ve written before of the restorative power of a shower and sleep, and once again that miracle combination did the trick. The next morning I felt ready for anything that life was going to throw at me. After sleeping in, but not really long, I enjoyed a leisurely breakfast knowing that I would spend the two days without 20lbs. of dead weight attached to my back. Just simply walking, free of that burden, lightens every step and you feel as though you can float. So I floated to my first priority of the day – don’t gasp – a laundromat. It’s difficult to convey the outsized importance that somewhat clean (and dry) clothes have in your life when all you have in your pack are two changes, and you sweat profusely every day when you wear one of those. 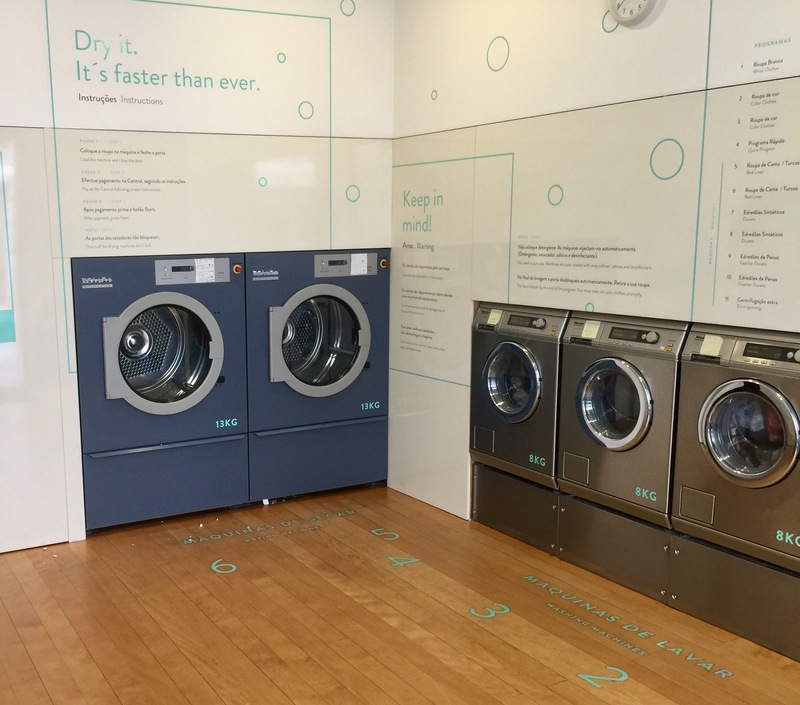 As it was, I was lucky to get to this tiny store-front launderette when I did. 15 minutes later people – non-Camino backpackers – were lining up. 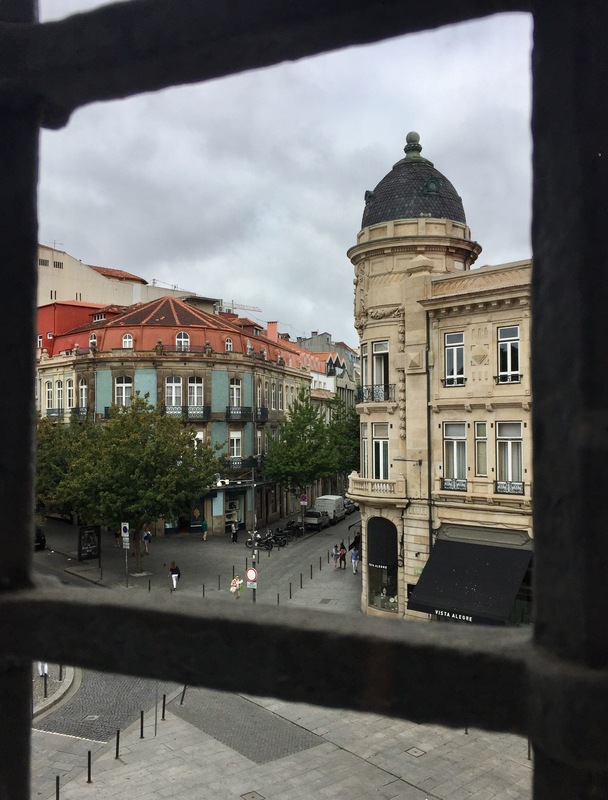 I was able to watch the scene, self-satisfied, from across the very narrow street, comfortably sipping a coffee and writing one of these essays. It was probably one of my better ones, I was feeling so smug. 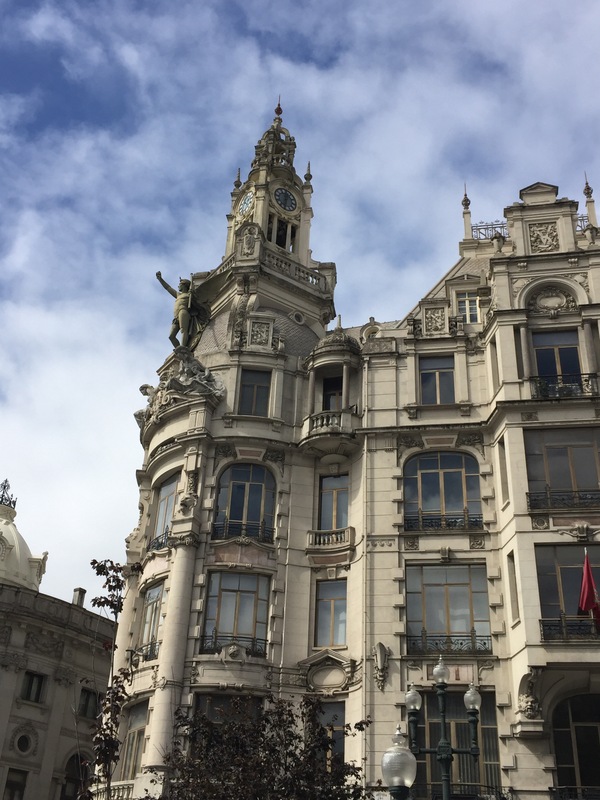 Once that chore was done, I felt even better than after a good sleep, and I was ready to explore the city. 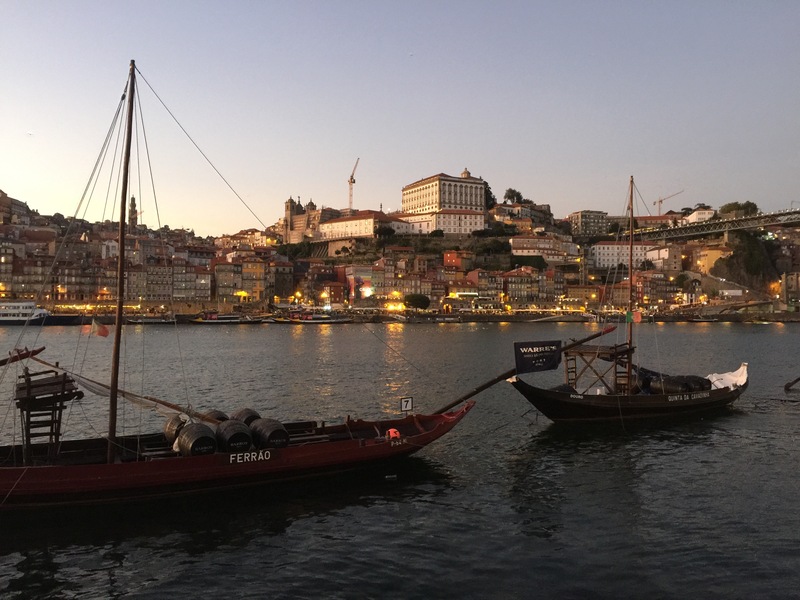 Porto and Portugal are as intertwined as the fact that the country’s name comes from that of the settlement that has become its second largest city. 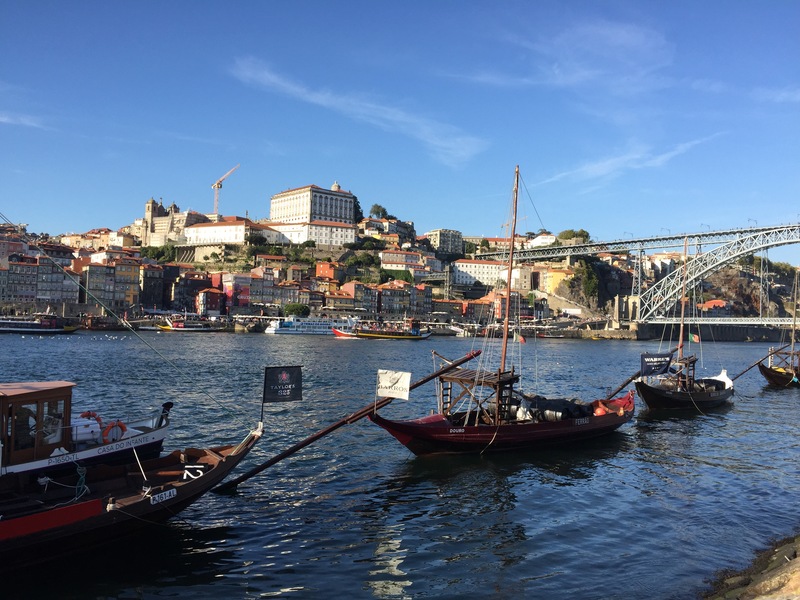 In vibrancy, though, Porto outshines the larger capital, Lisbon. 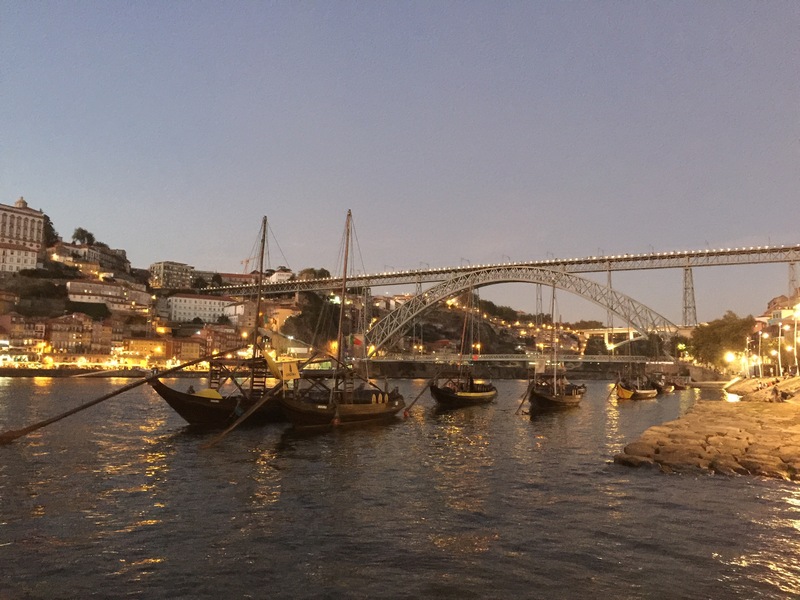 Both are built on multiple hills and along important rivers, the Tejo and the Douro ( the river of gold, for Porto), and both carry the amazing legacy of the competing cultures that occupied the Iberian peninsula over the ages, powerful Roman and Moorish (Islamic) influences along with the indigenous cultures. Here it all comes together in an amazing blend, full of life and full of energy. 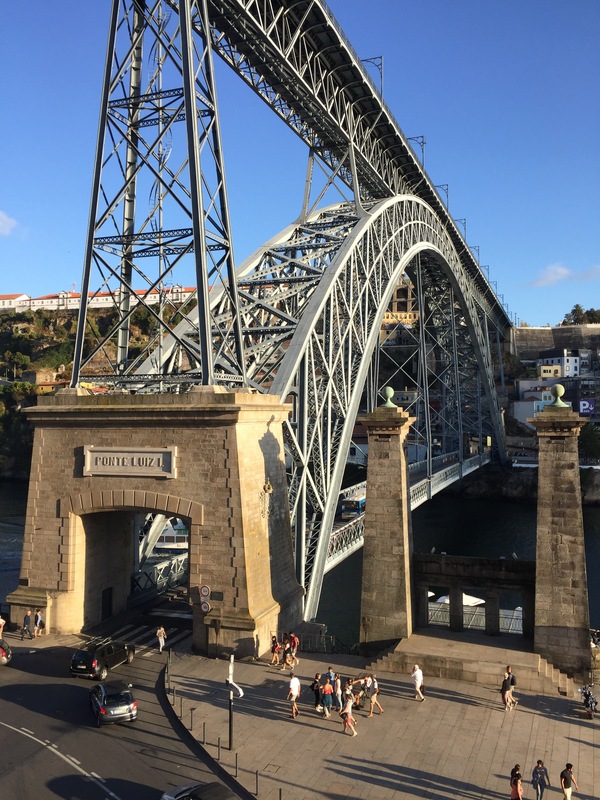 A first impression, though, is that Porto feels like Paris, though it’s been several decades since I spent time in the latter. 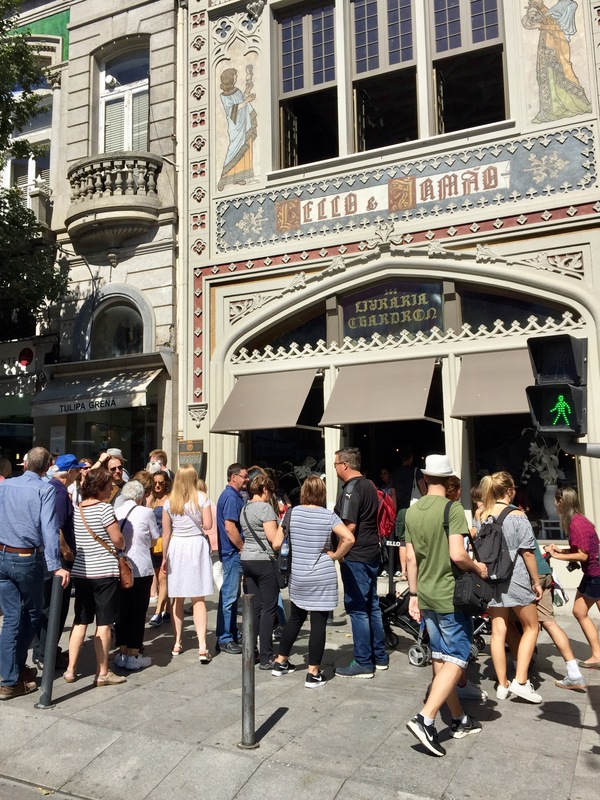 Everywhere you look you see people – locals and tourists occupying the countless open air restaurants, bars and coffee shops at all hours of the day. 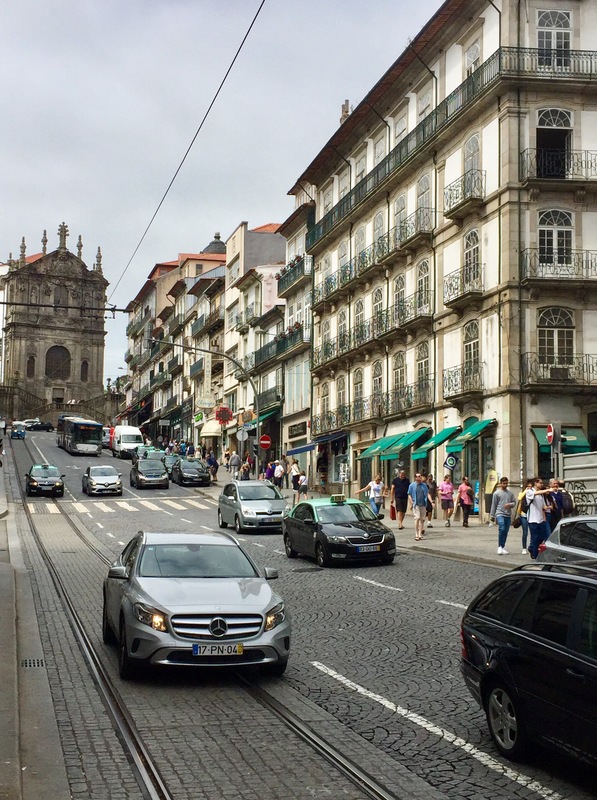 Traffic winds up and down through a maze of narrow streets, yet I’ve never seen drivers as attentive to pedestrians crossing the street as I have all across Portugal, including in this hectic city. Double-decker tour buses wind their way around the many plazas and streets that go off in multiple directions like spokes from a wheel, some up, some down and others straight out. The place just screams energy, noise, the joys of life. 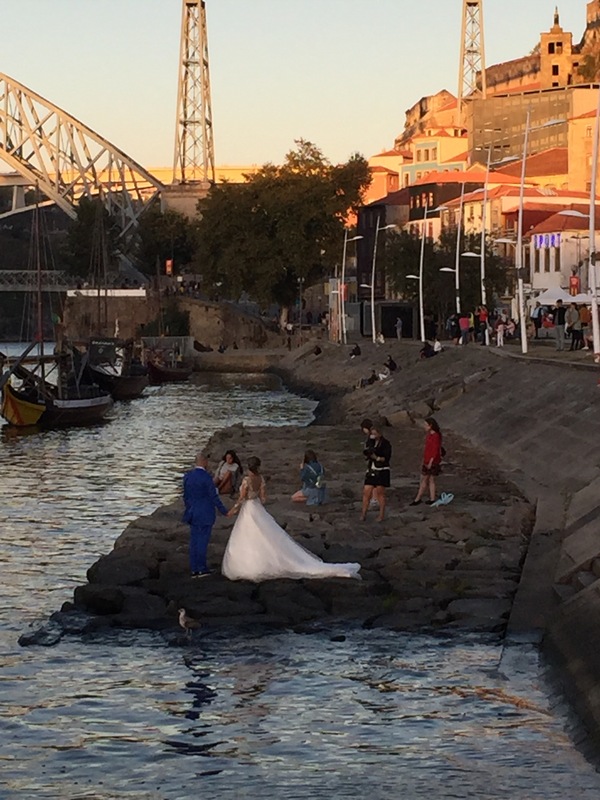 Porto is where the country’s beautiful people are. I was beginning to wonder as the folks in the villages I pass through are solid, kind but worn by hard work and probably too much sun. 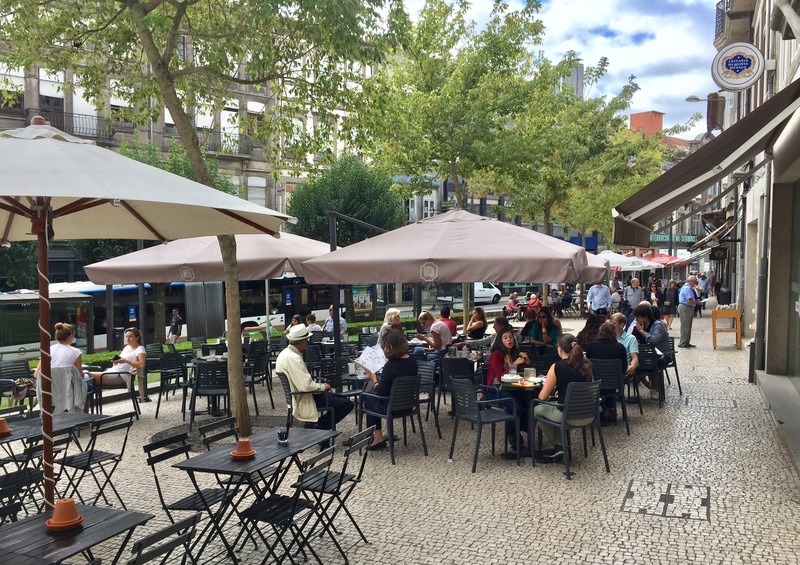 Porto’s locals seem more slender, better groomed and dressed, more refined, or at least pretending to be. 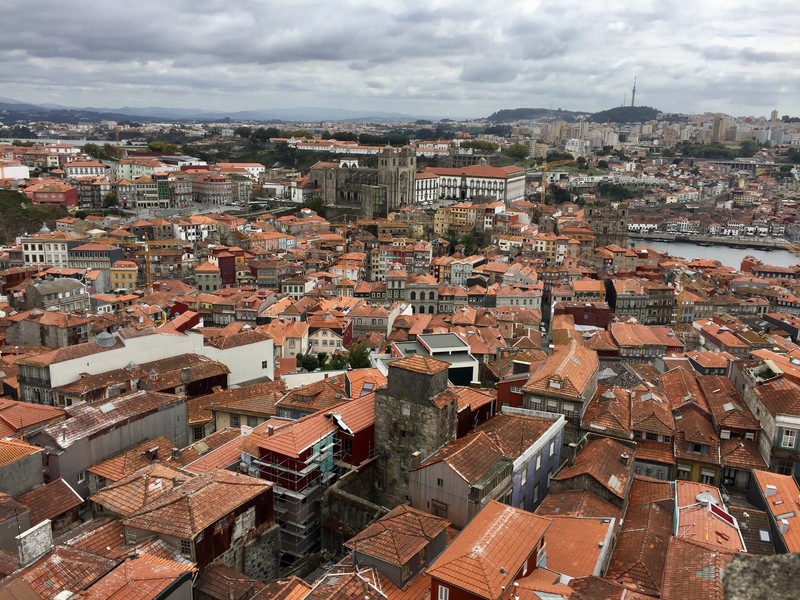 But the reality is it has a different feel from everywhere I’ve been so far, including Lisbon. I’m guessing the economy in the north is stronger than in the south, except for the far south – the Algarve – where I’ve not been but which I know to be the most popular tourist destination for sun-seeking Northern Europeans. On one street not far from my place I saw a small crowd waiting to get into an ordinary bookstore. A guard at the door controlled the flow inside. Was there a well-known author signing a new book? But wait, this is Portugal and most of those lined up are tourists; why would they be buying a Portuguese writer’s book. 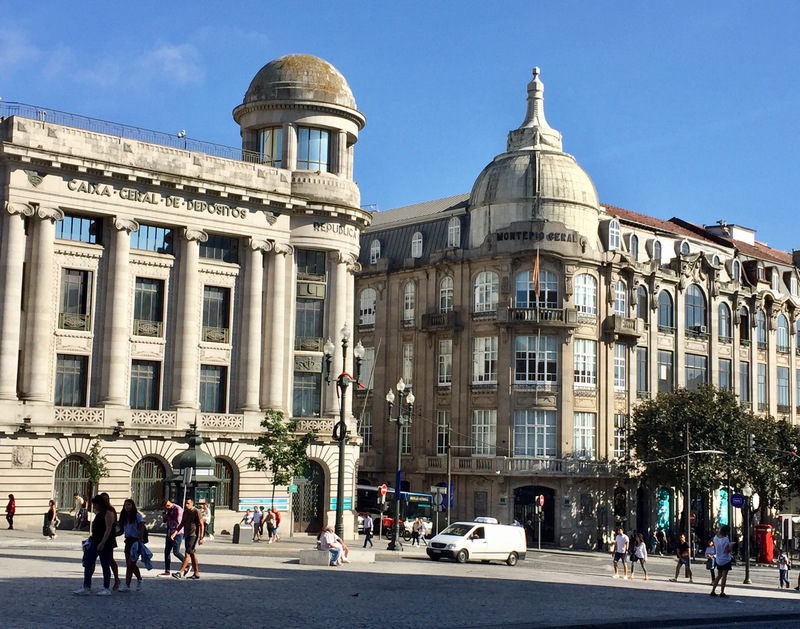 The answer was this: J.K. Rowling – I don’t need to explain – lived for a time in Porto, and sitting at a table in this store, wrote the book that changed her life forever. 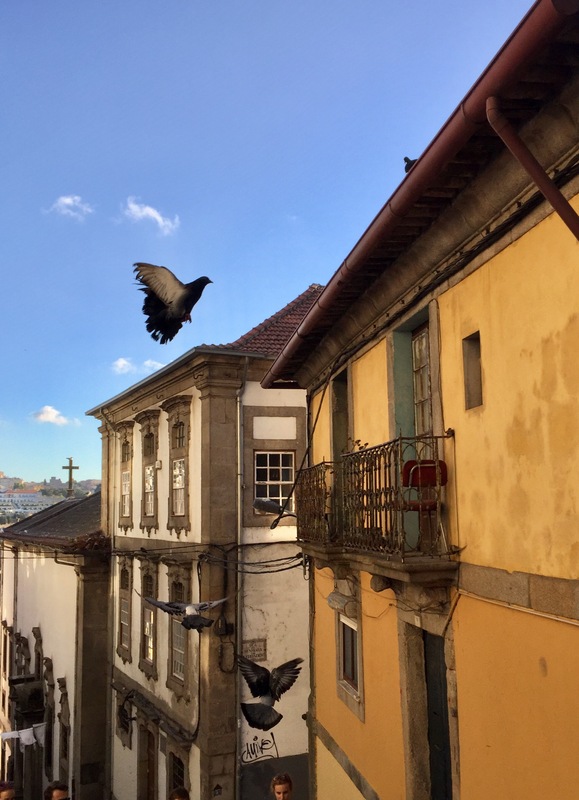 Everyone from the Caminho passing through or starting in Porto seeks a stamp in their credentials from the Cathedral of Porto. But the long-time, beloved Archbishop of the Diocese died on the 11th, the day I had arrived. Arguably the most important man in the city was lying in state and there was no regular access to the “Se.” On my attempt to obtain a stamp I witnessed the city’s elite – Suits, military uniforms, black but elegant dresses, and numerous television crews filming it all, these were my clues. – lining up at 1pm to enter the cathedral for what I assume was the Bishop’s Requiem Mass. Meanwhile, ordinary parishioners were attempting to find shady spots in the huge plaza, possibly for a later viewing of their religious leader’s mortal remains. 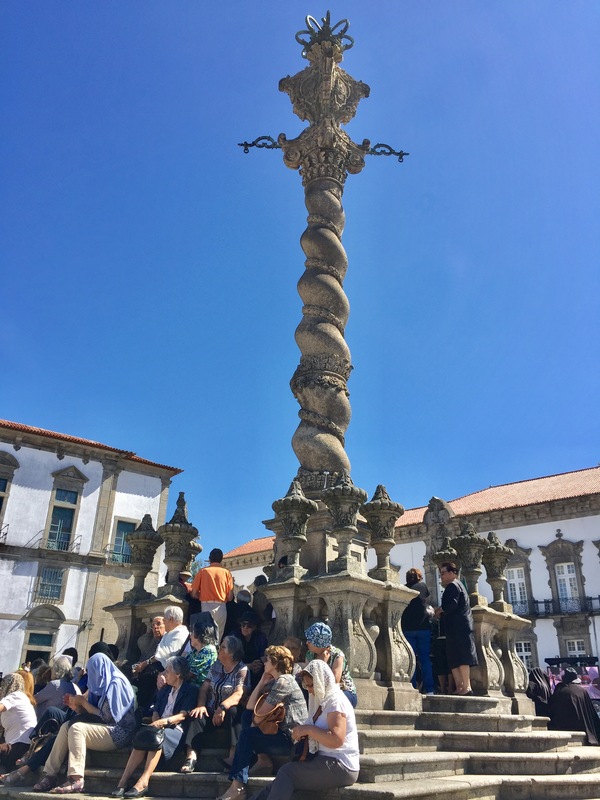 I found it ironic that one of the places where these people had gathered for rest was the large and impressive “solar pilarinho” or pillory, where their ancestors might’ve been punished directly in the face of the all-powerful church. 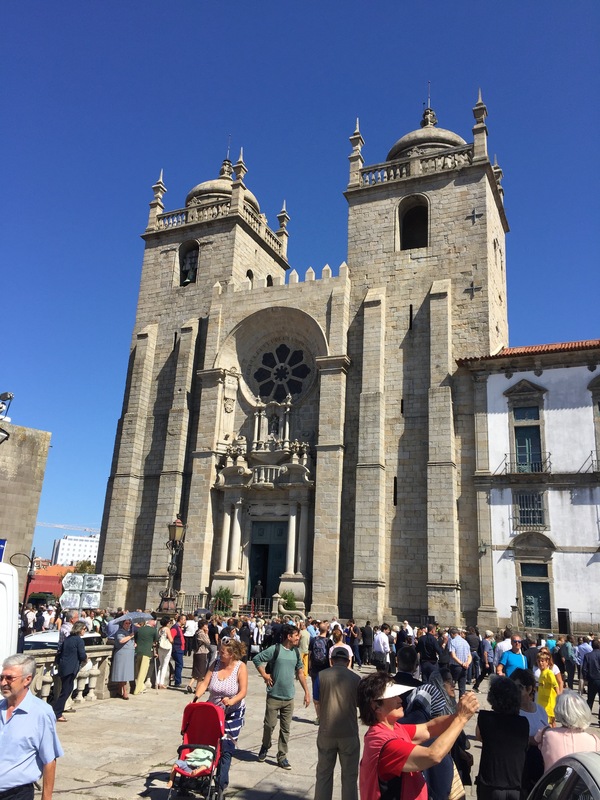 Instead of getting a stamp there, I stopped by another impressive church and easily obtained a “selo” there, officially recording my stop along the Caminho in this important place. 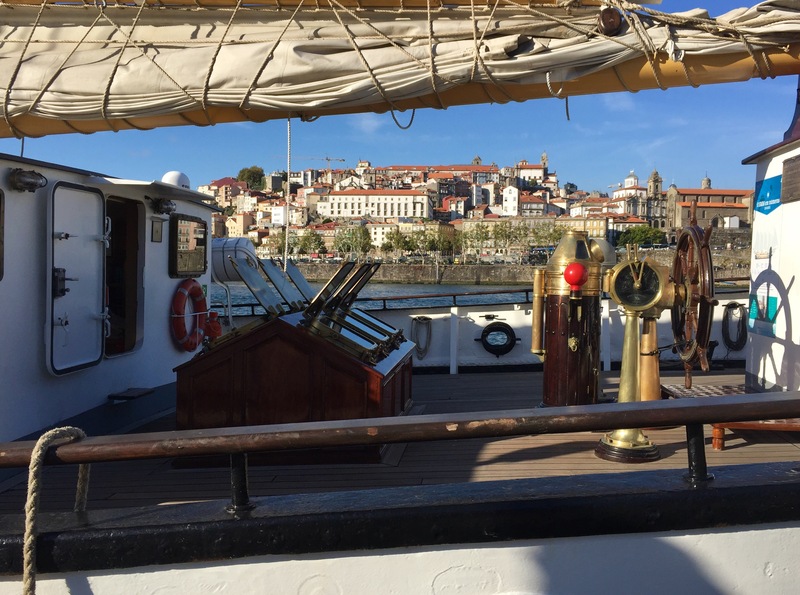 But frankly where I really wanted to go was the city’s lively waterfront, along both banks of the Douro. As a hobby photographer – even though I’m exclusively using an I-phone camera for this trip (my usual camera is heavy) – only two types of light get me excited, morning and evening light. Everything else looks flat. So I controlled my timing on both days to be in this area late in the day, hoping to capture the evening’s changes in light and in nightlife. 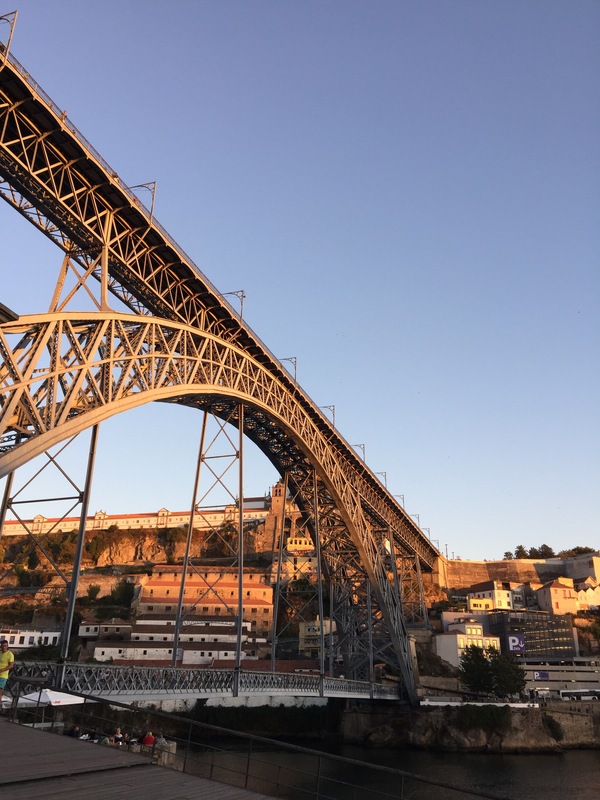 For personal reasons, the star attraction is the magnificent “Ponte Luiz I,” the bridge that connects the two sides of the river at its busiest point. 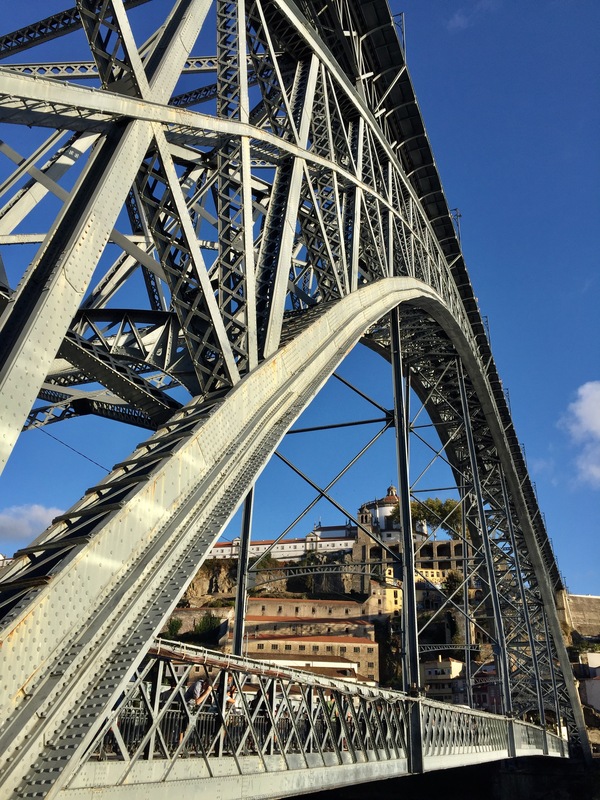 One of my grandfathers, the only one I knew, was a bridge-design engineer, so bridges just fascinate me. 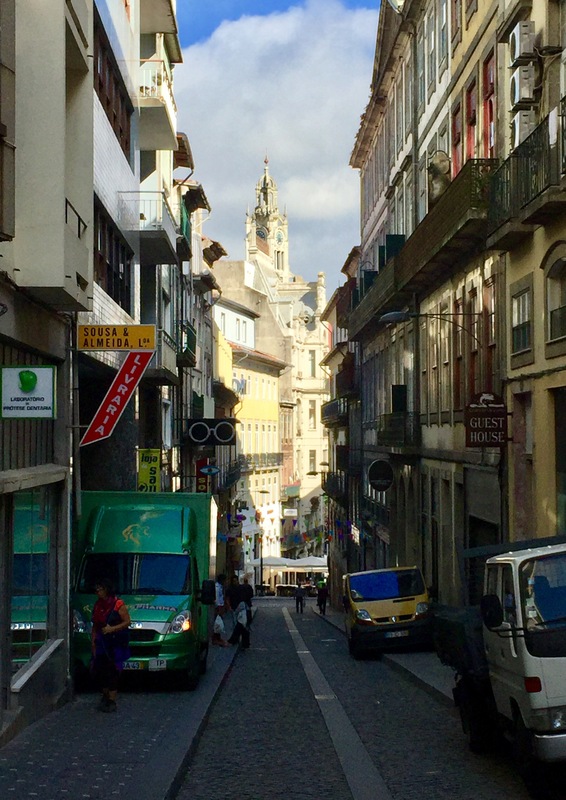 Others seem to like it too as it’s a popular subject of many photos, but the “busiest point” I referred to is where the city’s famed port wine houses age and market their highly-renowned products. 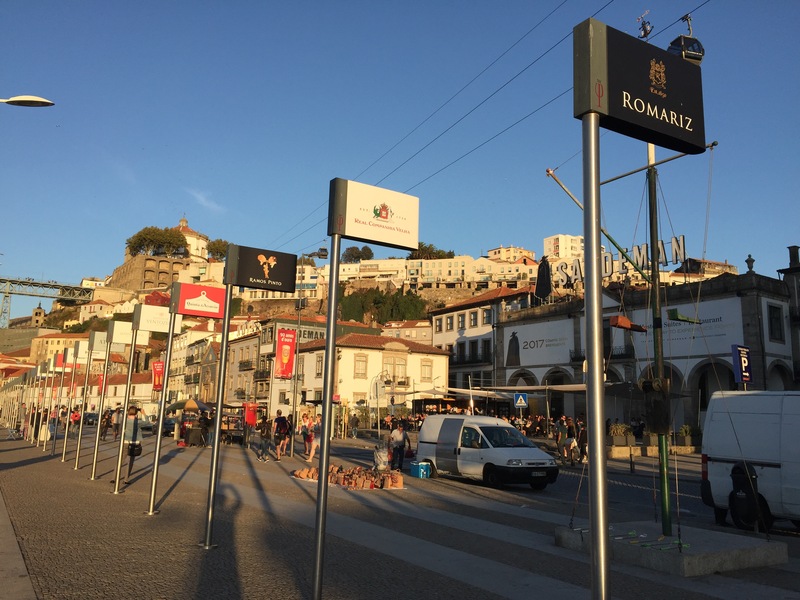 The eye is just overwhelmed by labels, tasting rooms and shops selling Portugal’s best known product. On my first visit to the area, I held off trying to get into a restaurant and waited until I was back in my apartment neighborhood. I had an excellent veal dish, a meal I typically don’t get at home. 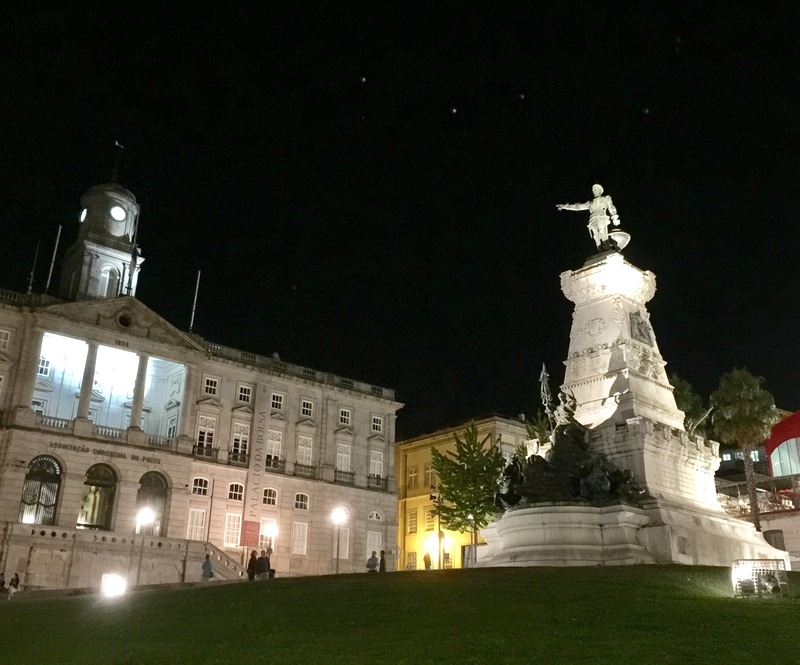 The second night, though I was able to get a small table in an obviously well-regard place on the north bank, not far below the statue of Henry the Navigator, pointing from his birthplace out to the sea. I saw Francesinha on the menu, a dish I knew to be a local favorite. Imagine an overblown grilled cheese sandwich but add at least three types of meat – sliced beef and chicken plus a sliced sausage. Then cover it with more cheese, a fried egg, and yes, even more melted cheese, and finally douse it with a meaty gravy. Mine was decorated with a full-dress shrimp with long tendrils and two black eyes. 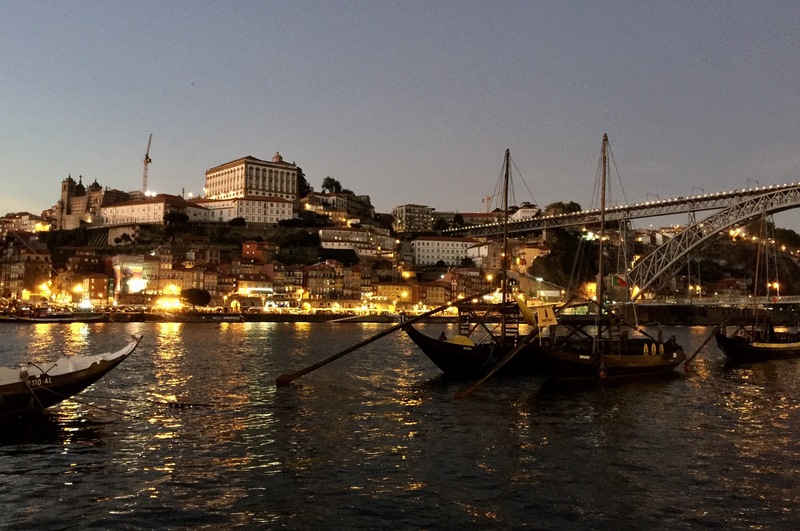 It all looked fine and I was anxious to taste this Porto delicacy… but alas, it was an enormous let-down. My waiter had been very attentive and was kind to me – I think he felt sorry for the lonely-looking man reading a book in his phone – so I felt obliged to relish the meal, but it was all an act they I couldn’t complete. It was, in fact, incredibly filling, but I had to leave a good portion uneaten, and that shrimp went back into the kitchen fully intact. I worked it off with a long strenuous hike back up into the heart of the city. 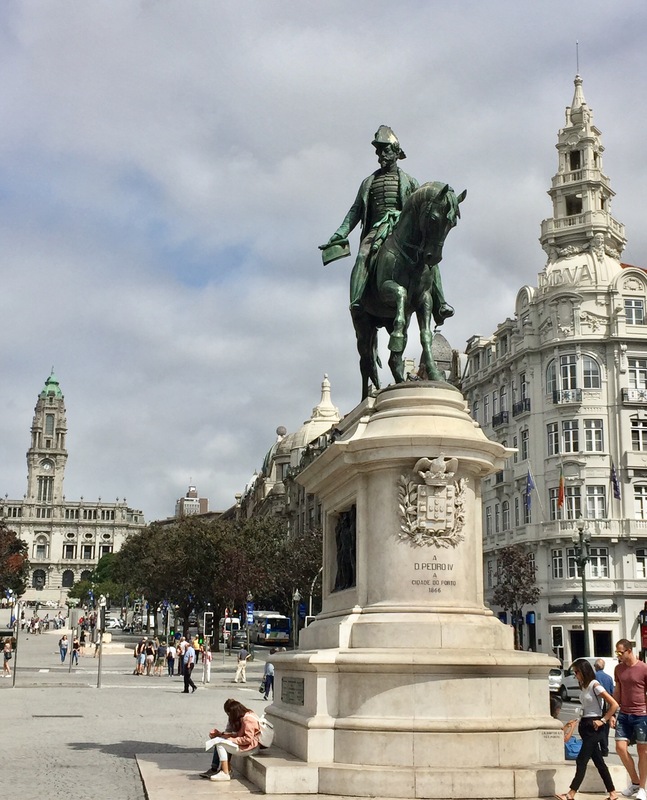 On the way I admired Henry’s famed statue – across the street from the house in which he was born in 1394, and not far up the hill from there I gazed into the shop window of Casa das Rolhas, established in 1850. 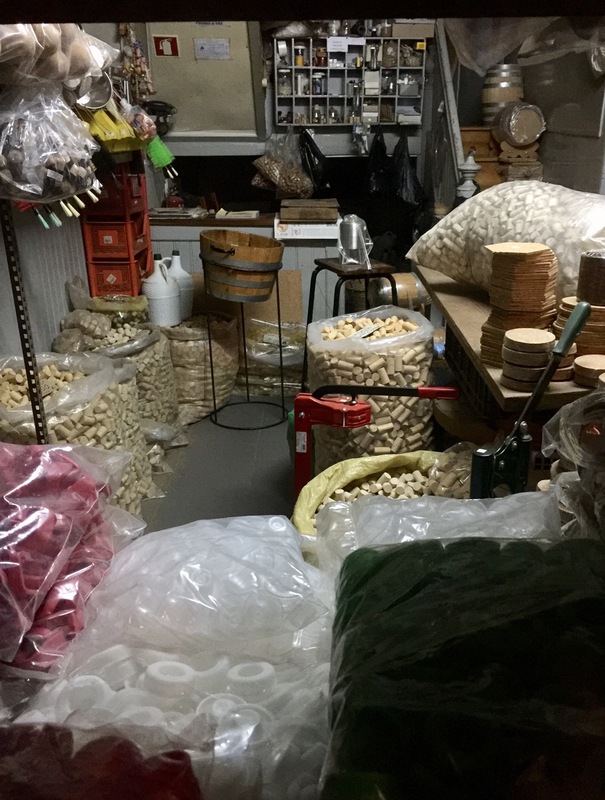 Their product: cork, all things cork, a small commodity in which Portugal leads the world. Further up the hill, yet, I couldn’t resist looking into the huge, old train station which was a busy place even as 10pm was approaching. 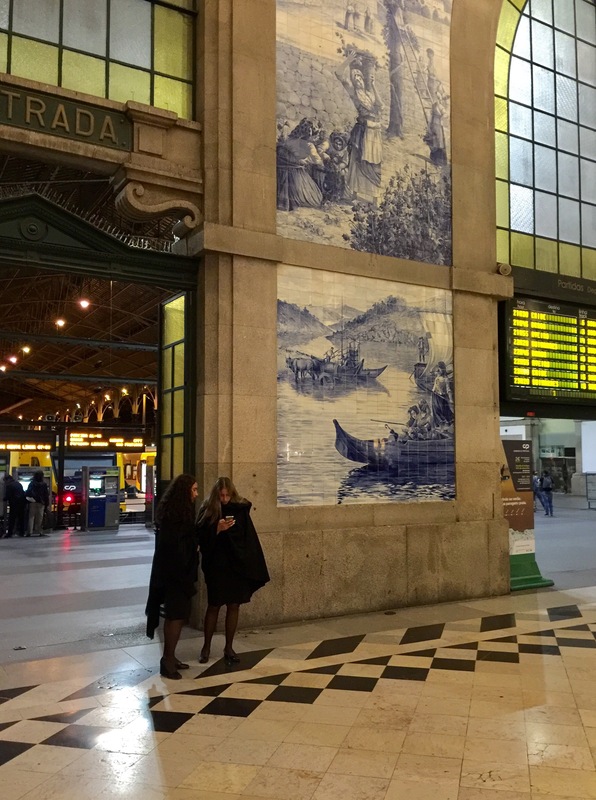 Its Azulejo murals – painted blue tiles – depicted local history and served as a reminder of the history I touched as I walked through this grand city the past two days but also the previous larger cities I had visited, Lisbon, Tomar and Coimbra. Tomorrow I’d start walking again, so a restorative night’s sleep was now a necessity. 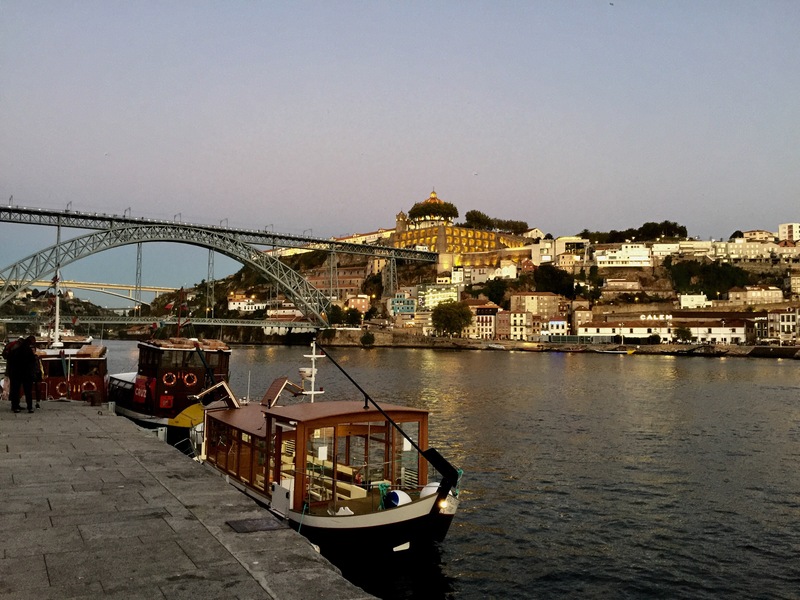 Still, I hated the stay in Porto coming to an end. I’ll be back, and next time Nancy will be with me, but we’ll skip having a Franceshina. Thank you for the beautiful pictures as well!! 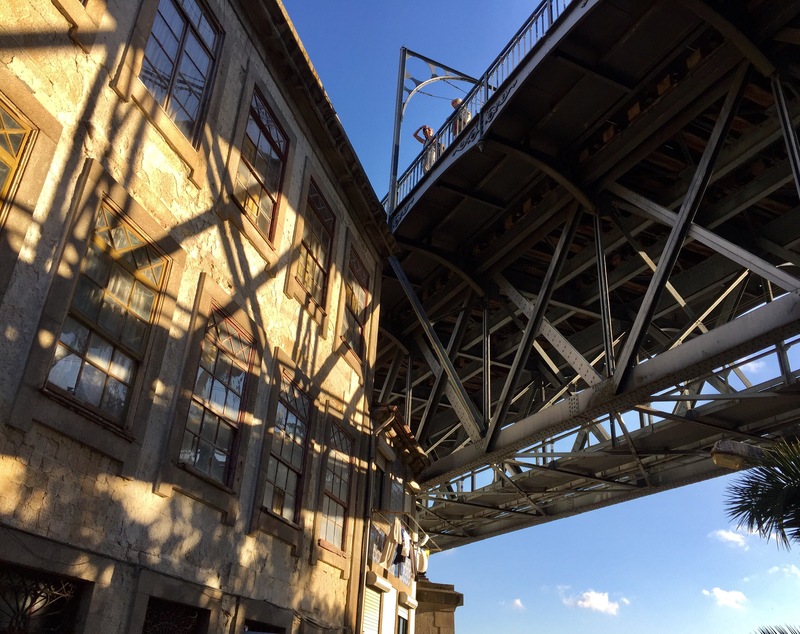 Thanks for sharing so many excellent images of what looks and sounds like an intriguing city! 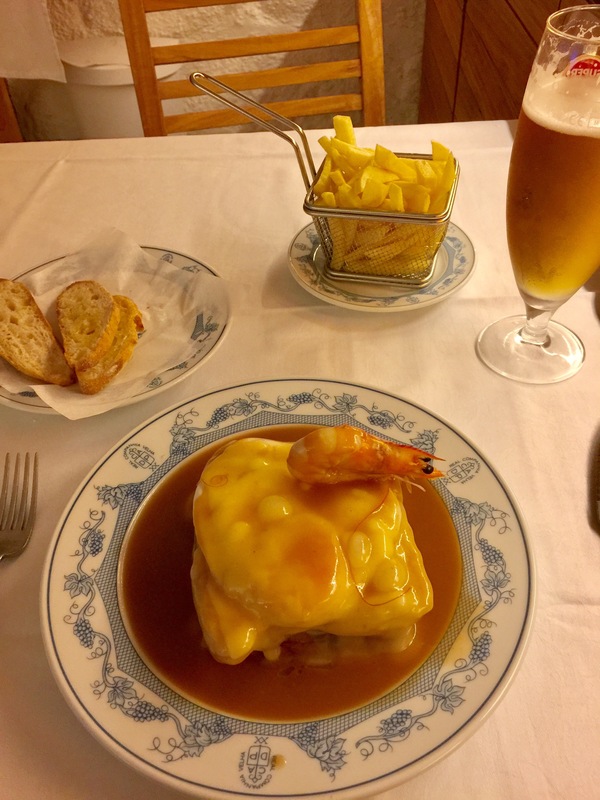 And I have to admit, the Francesinha looks a bit off-putting, especially with that shrimp glaring at you . . .
Great pics and narrative, Tony – easy to get immersed, as though one is actually there! I love grilled cheese and, so, was initially interested — until you kept going on with ALL of the ingredients … LOL! Loved reading your account. 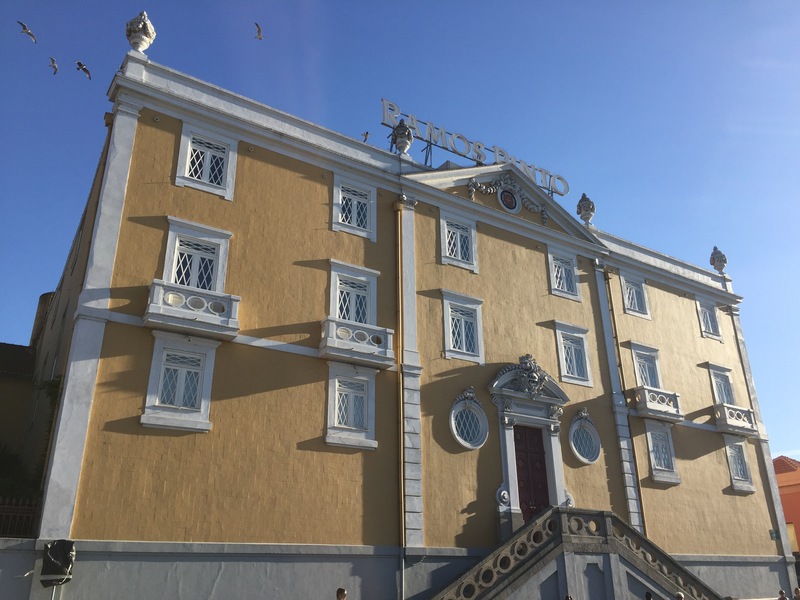 We plan to walk the Camino Portuguese next year, so I’d love the name of the hotel you stayed in in Porto? Thanks for the feedback. 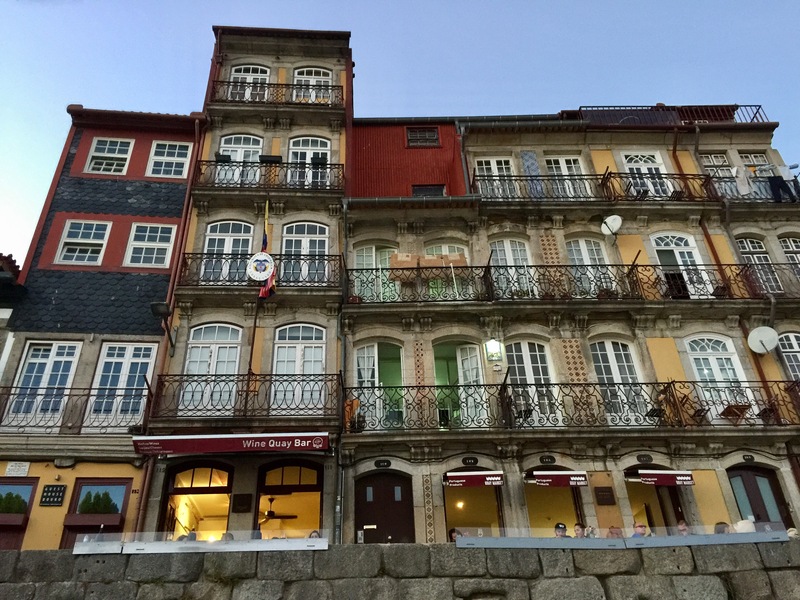 I stayed in one of the two apartments operated by the “Vivacity Porto” hotel. It’s actually a pretty modest place, but the apt. was perfect for a longer (3 night) stay. It’s very centrally located in a part of town with countless restaurants, etc. I could walk to most of the key sights in town, including a 30 minute walk down to the river Banks that I really enjoyed, esp. late in the day, before sunset. I booked it through Booking.com. Good Luck!